LSP Ceramics INC. is a manufacturer and distributor of industrial & technical ceramics with the most diversified inventory the industry. MYRTLE BEACH, SOUTH CAROLINA, UNITED STATES OF AMERICA, March 17, 2017 /EINPresswire.com/ -- Zirconium oxide (Zirconia) is an extremely tough ceramic with a hardness of >9 Mohs which makes it an excellent material for extreme wear, high temperature and harsh environment applications. zirconia ceramics have remarkable properties of strength, hardness and wear resistance in addition to withstanding attack from molten metal, organic solvents, acids and alkalis. They can also withstand high temperatures for long periods even under severe mechanical stress. Zirconium oxide is first choice for mechanical engineering. Zirconium oxide helps securely seal crown caps and prevents brake fluid in vehicle braking systems from overheating. It is not affected by highly abrasive yarns, is used to manufacture wires and also plays a role in making dental prostheses. It is hard to imagine a more versatile set of application areas for zirconium oxide. The experts at LSP Ceramics in Myrtle Beach, SC offer support in solving problems related to wear, corrosion or thermal insulation, namely with advanced ceramics whose potential is far from exhausted. This is where the similarities between ceramic and steel end. After all, both its friction coefficient and specific weight make ceramic the clear winner in the battle for the best material. While superior glide properties ensure less friction and contamination of the material being processed, advanced ceramics are also up to 25 percent lighter than steel, despite their remarkable density. Moreover, zirconium oxide is both electrically and thermally insulating. The latter helps promote desired warm-cold separation. 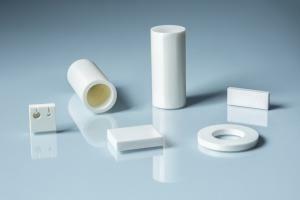 A positive example of the use of advanced ceramics as an insulation component can be found in the automotive industry. Installed in brake calipers, advanced ceramics prevent heat generated during braking from transferring to the brake fluid. Using advanced ceramics in forming processes prevents cold welds from developing. The smaller the grain size of the ceramic material selected, the greater the cutting edge stability provided. Yet another impressive feature of zirconium oxide is that it is highly ductile and has a flexural strength of up to 1,400 N/mm². These properties are leveraged during technical cutting, for instance in the textiles industry. Superior cutting edge stability is also of particular interest in medical products applications, e.g. for dental prostheses such as crowns, bridges or implants. Ceramics are also bioinert, meaning that they can be used to make dental prostheses without causing undesirable interactions with the body. Likewise, chemical substances such as acids and lyes don't stand a chance – they have no impact on ceramic materials. Thanks to its non-metallic origins, zirconium oxide is also not susceptible to corrosion. Wherever zirconium oxide is used, it delivers convincing performance due to its high quality and low rate of failure. This translates into less machine downtime and greater productivity. Zirconium oxide ceramics from LSP Ceramics are available in yellow or white depending on customer requirements and necessary adaptations for the specific field of application. This is relevant in cases where advanced ceramics are an integral part of mill technology, for example. Manufacturing grinding balls and rotors from a uniform, white material prevents color contamination in white dispersions. In general: Zirconium oxide is the ideal material for developing new fields of application or replacing steel components in machine and equipment construction applications that demand wear resistance, corrosion resistance or electrical and thermal insulation. Our custom parts inventory of unfired material allowing us the flexibility of supplying many custom components very efficiently. LSP Ceramics, INC. products are often unseen, but always indispensable. The products are used in many different applications today, especially in medical products, automotive manufacturing, electronics, equipment and machine construction, defense technologies, and chemical industries. LSP Industrial Ceramics, Inc. is located at 2050 Silver Spring Lane Myrtle Beach, SC 29577.